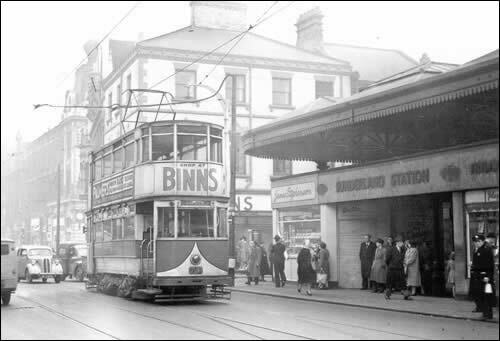 A fantastic photograph of a tram passing the entrance to Sunderland Station taken in 1954. Old cars and people walking in the street can be clearly seen. Sent in by © Allan Edwards. The tram, number 71 is not passing the station. It is at the terminus at the north end of the station, having approached from behind the camera and crossed to the outbound line by the angled track in the foreground. The lines running off on the left of the picture were not used for passenger service, only for depot workings. This photo was taken because the Circle tram route was to be closed, which took place on Sunday 3rd January 1954 and this old tram (dating from 1906) was then burned on the blockyard at Roker.